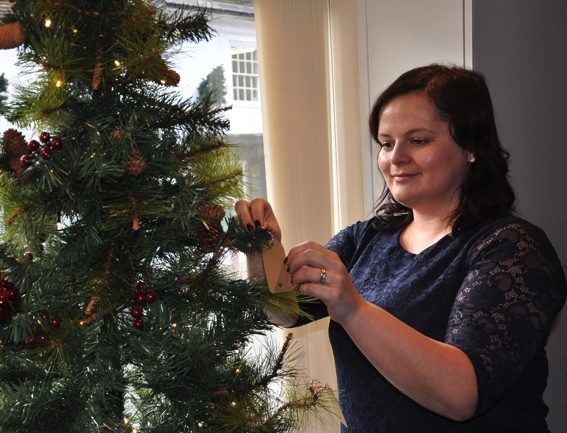 Dorset’s Douch Family Funeral Directors are inviting people to leave messages on Christmas remembrance trees in memory of lost loved ones. Now in it’s 3rd year the Christmas Remembrance Trees are becoming increasingly popular. Remembrance Trees are now standing at Douch & Small in Wimborne, AE Jolliffe & Son in Ferndown, Ives and Shand in Parkstone, Lesley Shand in Corfe Mullen and Blandford and Albert Marsh in Wareham and Upton. Anyone is invited to pop into a branch and write a message of remembrance and then hang it from a branch. Any donations made will go to the Cystic Fibrosis Trust. The group’s James Smith branch in Swanage sponsored a Christmas tree which was part of the festival at The Emmanuel Baptist Church in the town. Kathryn Clark, a funeral director at the Lesley Shand branch in Blandford, said: “We did it last year and people really appreciated the opportunity to write a message. “As a relatively new branch it also encourages people from the town to come in and say hello. “People really do find it helpful to write a message to a loved one – it doesn’t matter how long ago they passed away. We also have people, who live out of the area, contact us and ask us to hang a message on their behalf. “For many though it will be the first Christmas without a wife, husband, mother or father and the words are very moving.